Q Acoustics Q7000 review | What Hi-Fi? Q Acoustics has a great record in producing musical, confident and affordable speakers, and this Q7000 5.1 home cinema system is one of the products that helps that reputation. It ran away with a 2011 Product of the Year. It’s a tidy system, with five identical satellites finished in a sleek glossy black (or white) shell, each housing a pair of 7.5cm coated-paper mid/bass drivers that are placed either side of a 25mm ring radiator tweeter. The subwoofer has an interesting design: the speaker terminals and the 25cm paper cone driver are both hidden behind the side panel, which is held in position by a single bolt. This is primarily for aesthetic reasons – it gives the box a smart, clean look that’s in keeping with that of the satellites – but it also means the unit is less fussy about where it is positioned in a room. Another bonus is that it helps keep the wiring tucked away. The Q7000 is a refined-sounding package, and it seems to take particular care with dialogue. Take the scene when we’re first introduced to Black Widow in The Avengers, and you’ll find the voices clear and full of character. There’s also a smooth elegance to the surround sound even in quieter scenes. As the scene continues, the Q7000 proves itself to be a well-integrated system, with the punchy and well-paced subwoofer comfortably keeping in time with the rest of the system. Compared with the Canton Movie 1050, the Q7000 appears noticeably more organised and controlled: the separation and clarity of all the elements clearly mark the Q Acoustics as offering a much more desirable package. That said, the Q7000 doesn’t quite convey the feeling of space and openness as well as either the B&W MT-50 or the Monitor Audio MASS. Extended and varied listening reveals that it’s not quite as far-reaching in terms of scale and power. 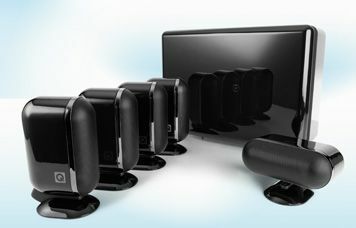 It might be more expensive than the Q7000, but the MASS system is a clear step above in outright power and performance. Surround effects are handled with more authority and confidence, while the Q7000 feels dainty in comparison. There’s a steady progression of dynamic shifts, but the Q Acoustics system does start to strain at higher volumes: the top end begins to run out of breathing space and becomes a bit too aggressive as a result. Even after a year we still have a soft spot for the Q7000. However, the MASS is a far more exciting listen and the Q7000 ultimately loses a star in this battle. Let’s not forget that this package won our Product of the Year Award in 2011, and there are still plenty of good reasons to buy it – not least its design and build quality. It’s just that, with the appearance of the MASS and MT-50, the Q7000 has been overtaken. It remains a good, if not the best, style speaker package at this price point.